5 on/off java buttons with your text added. Your site name added to the title area. All graphics you see on this page. 5 text links added at the bottom of the page if desired. Your logo graphics can be added. HTML code ready to add your content. If you need additional pages and/or menu buttons added for you, the cost is $20.00 per page. Each page will be set up and ready for you to add your content with the text links, buttons, site name and graphics. If you need extra buttons and not additional pages, the cost is $1.00 per button. 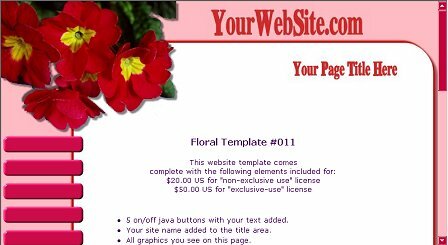 By purchasing an "Exclusive" license, this template will be removed and not sold again. EXCLUSIVE USE and NON EXCLUSIVE uses of these Graphics before purchase. You can securly order this Web Site Template online via credit card . If you do not wish to order online, you can use regular mail to send me a check or money order. There is a waiting period of 10 business days for checks to clear before delivery of these Graphics. Feel free to contact me should you have any other questions or concerns that are not addressed on this template.